PTSA - This excellent site of the Parent Teacher Student Association (?) is up to date and packed with detailed information. This used to be the PTA. You wonder if the kids show up to the meetings any better than the parents. The School Floor Plan is interesting if you haven't been back recently. Nancy Carson '57 and this Webmaster toured it a while back, and the old one was much better. Not even any deja vu in de new. Highline High School - This is the official page, but the excellent information source appears to be a bit out of date. Anyway, it is very useful for the events occurring in the first half of 2003, if you missed those. Highline Public Schools - More general information. Check out the District News. Highline Alumni Foundation - Publishes the Alumni Soundings newsletter, scholarships, reunion dates and donations. Highline Class of 1952 Site - A full blown imaginative site that shows what can be done. Highline Class of 1954 Site - These would have been the seniors when we were sophomores, so you will know some of these folks. Highline Class of 1958 Site - Note that this uses a URL with highline1958 instead of just highline58 like the other known sites. Highline Historical Society - From the rich trove owned by the society, very little is on the web site, but don't miss what is there. Don't miss the oral histories. The archive of the newsletters is here. History of Camp Kiwanis, Waskowitz, and Orcas Island, by Carl Jensen, published in Vol 36 of the Highline Historical Society News. Concludes in Vol 38. Burien Official Site - And who would have known Burien was founded by Gottlieb Von Boorian? I will leave the puns to you. Too easy. Highline Senior Center - Lists opportunities to volunteer and the many services available. 3st Book Exchange - Now there's one for the books. The free genealogy site lists all the high school year books on hand, including Highline 1950 through 1957 and many other years. She is placing high school year books on line, but hasn't done Highline. We shall see if she is interested in a link to us. Spend some time on this site. Just look at this. An Early Blog from the Burien area. What's doing in March, 1993 to present. This "journal" was started 10 years before the Blog became universal. And she is still at it. Check her archives page for a table of contents. There is apparently even an on line affair, in between mentions of the Burien Safeway and the Highline High School Gym class. Who says nothing happens in Boorian. Editor's note: she claims a "journal" is NOT a blog. Cecile Hansen - is Duwamish Tribal Chairwoman and works out of the tribe's office, most recently a rented Burien storefront next to a hair salon, less than two miles from the house where she lived as a Highline High School student in the 1950s....Hansen is the great-great-grandniece of Chief Seattle, and her grandmother is buried next to him on the Suquamish reservation. To read the Seattle Times article re Hansen's struggle to obtain Federal recognition of the Duwamish as a tribe. Try this subset of Seattle area museums from the Librarians Internet Index. Of particular interest is the site of the Des Moines Historical Society. You may know some of the officials, such as "Bubbles" Crowder. (We do give you all the news). In particular, look at the map of the Des Moines historical sites, clicking to see the pictures, prepared by Jared H. Thomas as part of his Eagle Scout requirements. The photos includes some great before and after shots. Or, if you are more interested in Edmonds history. The fireboat Duwamish? HistoryLink.org is an online encyclopedia of Washington State history. The link takes you to a subessay on the history of the Sea-Tac Airport and the local airports preceding it. Facinating for those who remember Bow Lake Airport. Click on home to access the full site. Here is a sample. Young timber magnate William E. Boeing (1881-1956) took his first flight from Lake Washington on July 4, 1915. 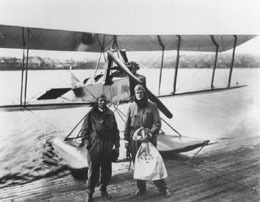 He chose the foot of Roanoke Street on Lake Union as the site for the Pacific Aero Club in 1916. There he and his partner, Navy Captain Conrad Westervelt built first aircraft, a pair of float planes dubbed the B&W. When America entered World War I in 1917, the Navy ordered an advanced version as a trainer and thereby launched the Boeing Airplane Company. Boeing expanded production by converting his private Duwamish River boatyard (now the famed Plant I “Red Barn,” which was relocated across the river to the Museum of Flight in the early 1980s) into an airplane factory. And about Sea Tac: A New Nest at Bow LakeThe Port of Seattle approved the Bow Lake site on March 30, 1942. Planners surveyed 906.9 acres roughly bounded by South 188th Street on the south, Des Moines Memorial Way on the west, South 160th Street on the north, and Highway 99 on the east. The Port spent $637,019 to acquire the site from 264 individual owners.